With the sun out to play, it’s the perfect time of year to turn the dryer off and put the clothesline up. 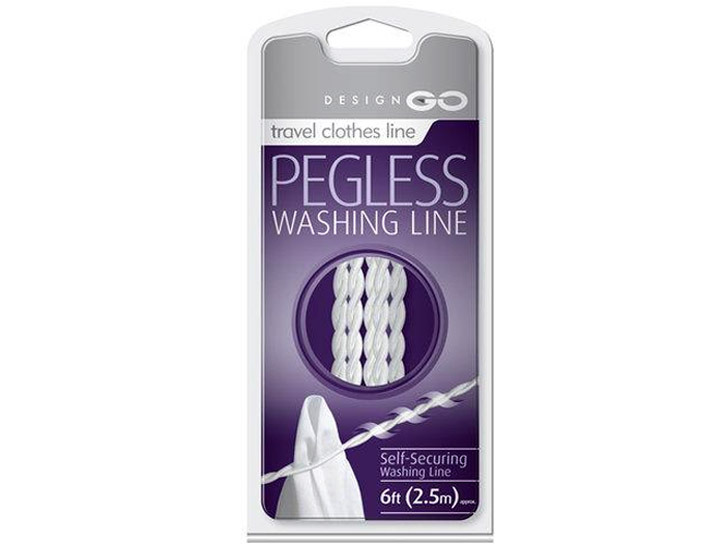 Let your clothes hang out au naturel with the six-foot-long peglesss travel clothesline by Design Go. Your choice of suction cup or metal hook makes it easy to install in any environment. Off on a holiday? Pack it in your suitcase for easy drying on the go. Or tack it up on your 16th floor balcony at home to freshly air-dry your wash. You don’t need to remember the clothespins, either—the self-securing design squeezes garments in place. With the sun out to play, it's the perfect time of year to turn the dryer off and put the clothesline up. Let your clothes hang out au naturel with the six-foot-long peglesss travel clothesline by Design Go. Your choice of suction cup or metal hook makes it easy to install in any environment. Off on a holiday? Pack it in your suitcase for easy drying on the go. Or tack it up on your 16th floor balcony at home to freshly air-dry your wash. You don't need to remember the clothespins, either�the self-securing design squeezes garments in place.